It is Friday again… We love weekend, especially when we can have fun and enjoy the day. My daughters love to play with the sprinkler at the backyard, especially in the hot hot summer days! And… today is Stuck On U Sketches has new Die Cut Challenge on their blog! The challenge is that add ANYTHING IN THE WATER die cut shapes on your project. I created this card using my Silhouette Cameo. I found this whale with wave set on Silhoeutte Online Store. Isn’t that cute? The background cloud I stamped the 3 clouds from Lifting Spirits stamp set (C1570) with Sky Exclusive Inks Stamp Pad. The plane, banner and sentiment are also from the same set. I stamped them with Black Exclusive Inks Stamp Pad and colored the plane with pencil color. Then fussy cut them and I added them on the card with glue dots, the very bottom wave I used 3D foam tape to give extra dimension. Join us and let’s have fun! Link up your projects at the SOUS Die Cut Challenge! And thank you so much for visiting my blog today! super cute! 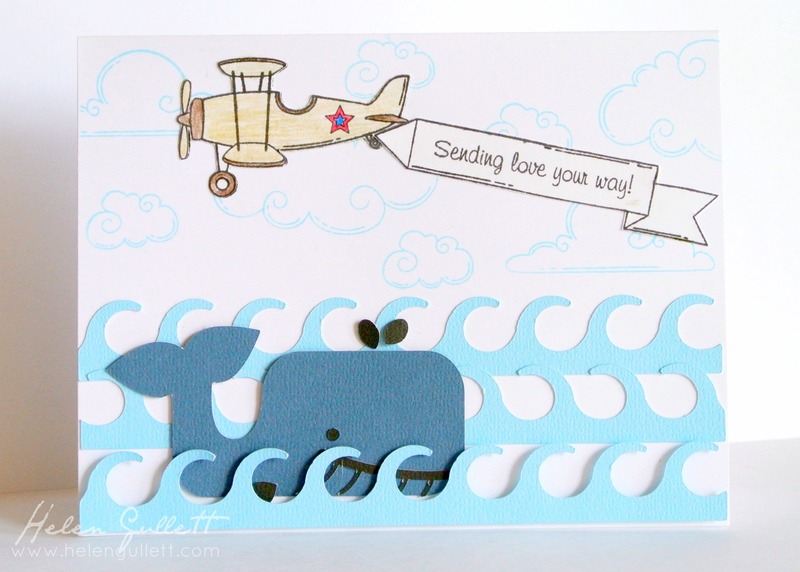 Love that whale and the waves! Love this fun scene that you created! I really like the shape of the waves! That is just too cute! Thanks for Linking up at My Favorite Things Saturday!